You may know it as one of Pomona’s better taco shops, but 2128 N. Garey Ave. (at La Verne Street) began its life as an Orange Julius stand. And it’s not long for this world, as the wrecking crew is coming. The stand will be demolished as part of the renovations of the undistinguished strip mall behind it. A new, undetermined restaurant will replace Lily’s. In the meantime, Lily’s is still serving customers despite being isolated by construction. You have to admire their gumption. And Lily’s is going to relocate — more on that in a moment. What’s the history? The stand operated as an Orange Julius drive-in from its opening in 1963 until 1980. From that point, the stand was home to a series of taquerias; Lucky 7, El Merendero, Tehuacan, Los Dos Compadres and Taqueria Alvarez are the names brought to my attention. 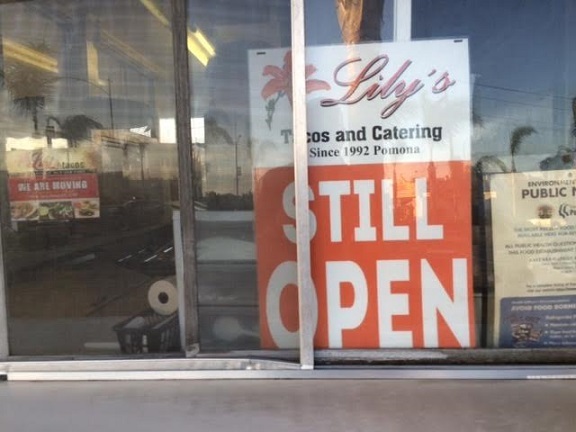 Lily’s has been the longest tenant, since 1992 according to its sign, which means Lily’s occupied the stand longer than Orange Julius. How about that! Lily’s was a neat spot, especially on a warm night, when you could eat in comfort on the picnic tables out in front of the walk-up stand. The food was reliably good and they would even serve it on a plastic plate and put your drink in a plastic cup. I had dinner there Monday, for the first time in a couple of years. It required parking in the adjacent lot for Las Margaritas and walking around from the sidewalk. 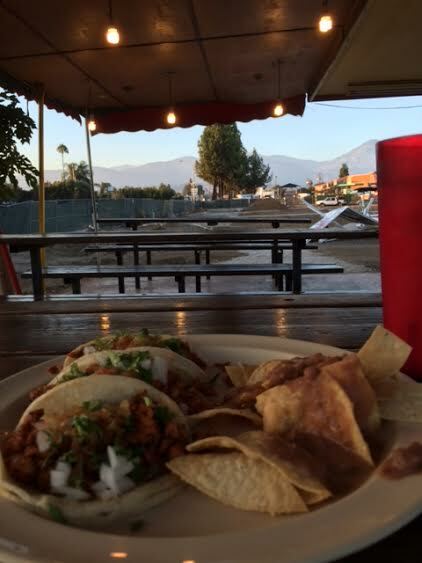 I got three al pastor tacos and a medium horchata for $6.06 and ate at one of the three picnic tables. It was a nice outing and a chance to remember meals past under that shaded awning, light bulbs hanging, the sizzle of the grill audible. Thankfully, Lily’s will survive elsewhere — and indoors this time. An employee said they hope to open within six weeks. They’ll remain at the little stand as long as they can. 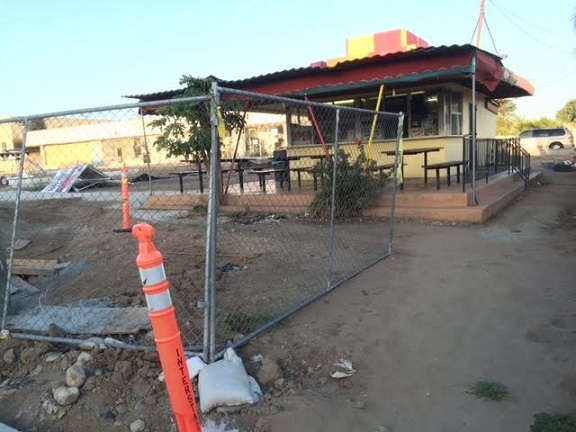 This entry was posted in Around Pomona and tagged Pomona, tacos by David Allen. Bookmark the permalink. Not one Lily’s but two? I’m all for spreading the Lily’s gospel to taco-deprived La Verne. Back “in the day”, that was the North Pomona Orange Julius. The South Pomona location was on West Mission, at S. Dudley, close to Westmont and across the street from General Dynamics. 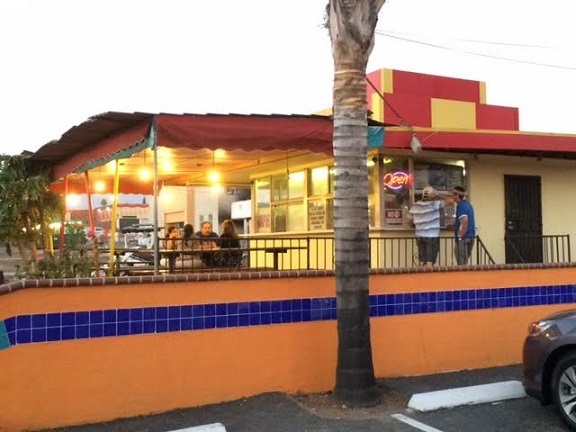 Funny, the current South Pomona location is also a taco shop. I was really happy when they added pineapple to their choice of drinks. But…there might have been one more in town that I can’t remember. Oh the memories…Taco Lita, Hull House, Seapy’s, Big Enuff cafe…it goes on and on. I knew you’d have something to say on this one, Bob. Is the south Pomona shop Buen Taco? A block east of the old hardware store? As for the pineapple Julius, I usually ordered that myself from the Midwestern stores of my youth. It was more exotic than orange. Yes it is. My “okie” grandparents used to live across the street at Big’s Mobile Home Park. Sometimes I would drive with my grandfather to the market there in Westmont, I think it was called Lucky Strike Market, or that might have been the name of the one on North Park Ave. But either way, when we parked his old but clean Cadillac, he had to first open the trunk…pull up the spare tire…and take a swig from his bottle of “hooch” that he kept hidden from my grandmother. Best breakfast burritos in the San Gabriel Valley.